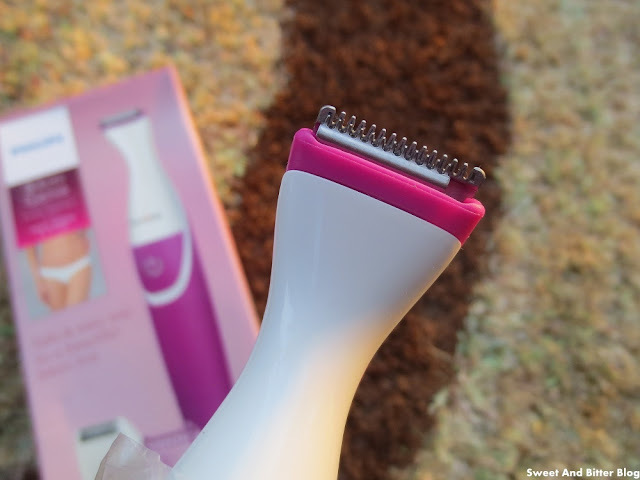 About - Philips Bikini Genie is designed to trim, shave & style and can be used wet & dry. There are no wires or there is no need to charge. It works with a AA battery so, consider yourself safe even if you are one a stranded in a secluded island (just carry your battery!). Unboxing - BRT382/15 box contains the main body attached to the trim head. Along with that there is a 4mm trimming comb to be attached to the trimmer and additional shave head. There is also pouch to carry it all and a battery to operate the same. There is a brush to clean it off. Ergonomics - The rubberized body provides the safe grip required to operate this. Thankfully, no wires to tangle you while you skillfully maneuver it along those tricky curves. Cleansing - The brush can be used during use to keep the heads clean. After use, once can clean it under water. Trim Head – Trims to 1mm length with ease. I was worried that it might cut and I might get nicks but I was wrong. It is designed keeping safety in mind. I kept my finger on top of it to check and it does no harm. It only cuts the hair that falls between the blades and nothing else. 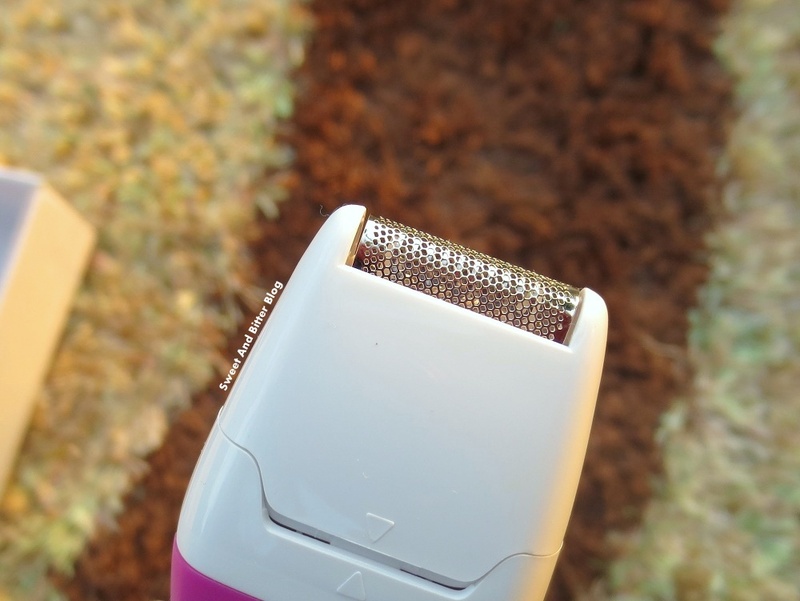 When used with the combing head, it trims to 4mm. Shave Head – Again keeping safety mind, the shave head has rounded edge which cuts only the hair that gets in it. It is supposed to be used after trimming to make the whole experience easier and manageable. Personally, I have not got much outcome from this. It does not shaves clean. Now, the main question – Is Philips Bikini Genie better that the age old alternatives? Shaving - Using a razor is something that I personally do not like because I am afraid of cuts as there are no special razors to cater the exact need in Indian market. Also, the regrowth is generally pokey and highly uncomfortable (I cannot describe to anyone who have not personally experienced it!). Using an epilator has its own concerns. The head of epilators are bigger and unlike this Bikini Genie does not have anything for safety of intimate areas. Trimming - Using a scissors is equally scary. There are special rounded tip ones that are bit safer but then the chances of cuts and nicks remains there when you to trim close to skin. Ouch! Waxing - It is something I cannot do on my own. Still not confident to visit a parlor for the same. Also, my pain tolerance index is not that high. Ouch! Ouch! Ouch! Second important question - Regrowth? As the roots, stay there, there is no chances of ingrowth or skin irritations. Also, the growth is neither accelerated nor there is any change of direction etc. Overall - In this world when women use public washrooms, personal hygiene is of biggest concern because there are many diseases and infections linked to the same. Wipes and cleansers specially created for intimate areas are a must. Adding to that, keeping your intimate areas groomed and proper is also necessary. One cannot takes changes with health. Can we? There are also studies which shows that hair is necessary. So, instead of waxing, you can trim it to shorter length. While shaving and trimming with the age old methods have its issues, I am happy to discover Philips Bikini Genie which is designed keeping safety and hygiene in mind and delivers completely pain free solution. The price obviously is too much to pay at one go. So, keep an eye for offers in the market.